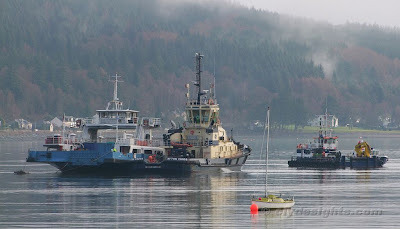 As daylight broke on Friday morning, the Diver Training Vessel SLEAT presented an unusual appearance in the Holy Loch. During the night, it appears that her forward engine room had become flooded, resulting in her settling down by the head. 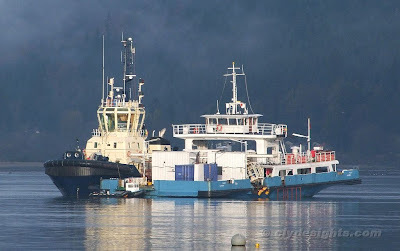 Later in the morning, the Clyde Pilot Cutter TOWARD arrived, together with the workboat TORCH, and Svitzer's tug AYTON CROSS. 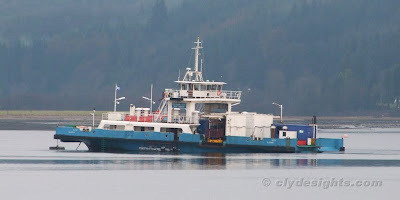 Arrangements were made to pump out the water from the former car ferry, and later in the day, SLEAT was towed from her mooring to the nearby pier at the Holy Loch Marina. Once alongside the pier, SLEAT was made watertight once more, and on Saturday she returned to her mooring in the middle of the loch. Fantastic set of pictures,I have enjoyed your "yesterdays Clyde Sights"